This article is 2508 days old. In the early morning hours of June 6th 2010, a tornado cut a path through Leamington in the vicinity of Bevel Line and Seacliff Drive. It ran a course of approximately half a kilometre. Every large tree along Seacliff Drive from Erie Street in Leamington to Union Avenue in Kingsville was either damaged or completely uprooted, changing the landscape and the lives of those who live there. 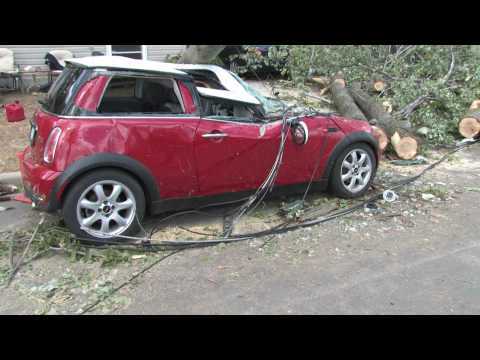 windsoriteDOTca presents a chronology of the Leamington Tornado and storms that ripped through Windsor-Essex between June 5th and 6th 2010. Click to read each story. Environment Canada has just issued a Tornado Warning for Windsor and Essex County. Please take proper precautions and measures to ensure your safety. Storms may have damaged parts of Harrow and most of Leamington last night, but Michigan and Ohio were also hit hard by the same storm system. A year later, Leamington’s Seacliff Park was reborn with tree sculptures and a pledge from the municipality to plant one tree for every tree lost during the night of the tornado.